📍 Alumni Stadium – Chestnut Hill, Mass. 🏈⏰ Kickoff Time – 8:00 p.m.
No. 2/2 Clemson will be in search of its fourth consecutive ACC Atlantic Division title when it travels to face the No. 17/14 Boston College Eagles on Saturday, Nov. 10. Kickoff from Alumni Stadium is scheduled for 8 p.m. ET. Head Coach Dabo Swinney and the Tigers list five goals at the start of each season: Win the opener, win the division, win the state, win the conference and win the closer. Clemson accomplished goal No. 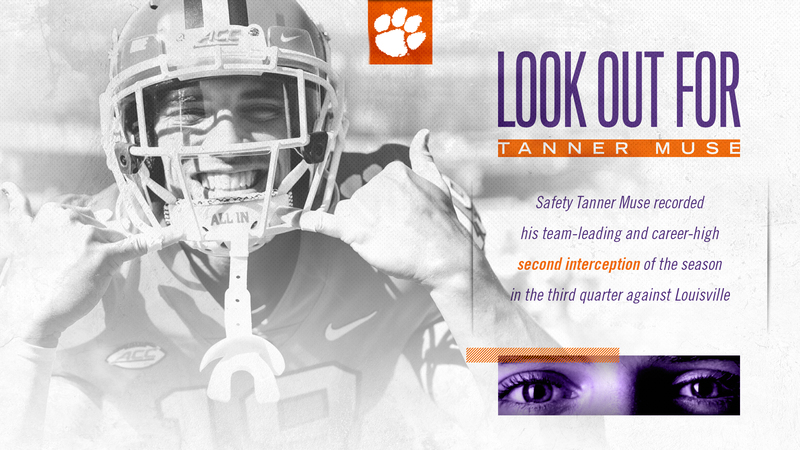 1 in September, and this week represents an opportunity for Clemson to secure goal No. 2. With a victory Saturday, Clemson can win the Atlantic Division and become the first team to win four straight division titles since the ACC’s formation of divisions in 2005. A division title would be Clemson’s sixth overall in that span, which would add to the most of any ACC Atlantic program and tie Virginia Tech for the most of any ACC program in either division. A win would also represent the 50th by the Clemson senior class since 2015, which would tie school and ACC records for wins by a senior class. A victory would give Clemson its eighth consecutive 10-win season to tie Miami (1985-92) and Virginia Tech (2004-11) for the fourth-longest streak of 10-win seasons in FBS history. 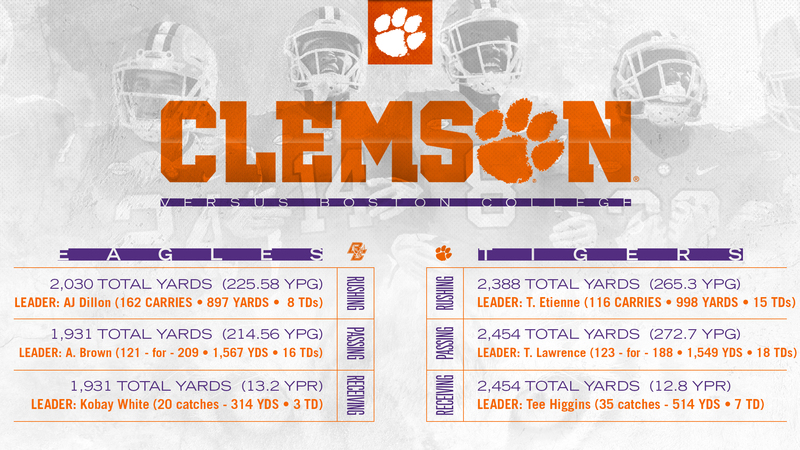 Clemson’s ability to reach its goals this season has been aided in part by the ground game on both sides of the ball. Clemson ranks No. 1 in the nation in both yards per carry (6.94) and yards per carry against (2.24). With a school-record 13.3 yards per carry last week and 11.8 vs. Wake Forest, Clemson became only the second FBS team since 2000 to record multiple games with at least 11.0 yards per carry in a single season (Marshall, two in 2013). Clemson has worked with law enforcement to crackdown on the sale of counterfeit tickets and illegal merchandise around Memorial Stadium. This practice is done to ensure the quality of merchandise and validity of tickets can be verified and our fans are protected from substandard items and counterfeit tickets. Officials have been notified this game presents an increased risk of counterfeit tickets in the areas surrounding Memorial Stadium. Fans are encouraged to be diligent when purchasing tickets through unofficial sources – the Clemson Athletic Ticket office and StubHub are the only verified locations to purchase tickets to Clemson athletic events. Fans can verify the legitimacy of valid tickets by looking for specific security features and quality standards. Official tickets have quality foil stamping, bright colored print and are on quality paper stock. If you have questions about the legitimacy of tickets, you can bring them to the Athletic Ticket Office prior to purchasing to verify their authenticity.